The final design and construction of the classroom was done entirely by volunteers from the community, church and preschool. Families who have an interest and/or careers as landscapers, artists, engineers, gardeners and woodworkers made this classroom possible. A variety of materials from the region enabled them to personalize the space. When choosing the plantings for the space, care was taken to pick a variety of textures, shapes and colors along with different blooming seasons to provide color throughout the year. 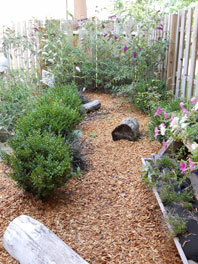 The staff was very deliberate in maintaining a “natural” look throughout the area. 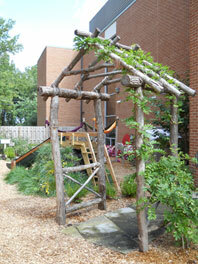 Wood was used throughout the classroom in signs, fencing, benches, birdhouses and each area. 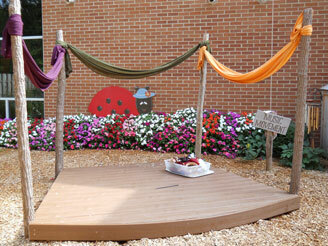 The Nature Explore program was a perfect fit for Bay Presbyterian’s “learning through play” philosophy.